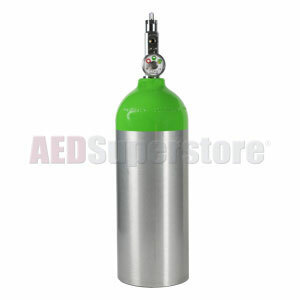 LIFE OxygenPac easily disposable or refillable Spare Cylinder by LIFE Corporation. Includes 566 liter "R" Aluminum Cylinder, constant reading supply gauge, brass CGA 870 valve, and oxygen fill ready to use. This Spare Cylinder is simple to change before, during, or after use. A six liter flow rate will yield over 90 minutes of oxygen. Note: Because all LIFE® Spare Cylinders are shipped completely filled and ready-to-use, they must be shipped via UPS Ground.